This Category feature Hot Tub Cover Wind Strap Kits..
My Hot Tub is safe and sound because of your incredible Hot Tub Straps! Yes, I bought all FOUR! Yes, we tied down the cover, the cover cap, and used all 4 straps of the windstrap kit in preparation for Hurricane Michael. The wind tried very hard to remove the cap but didn’t lift the cover. It saved my Hot Tub! 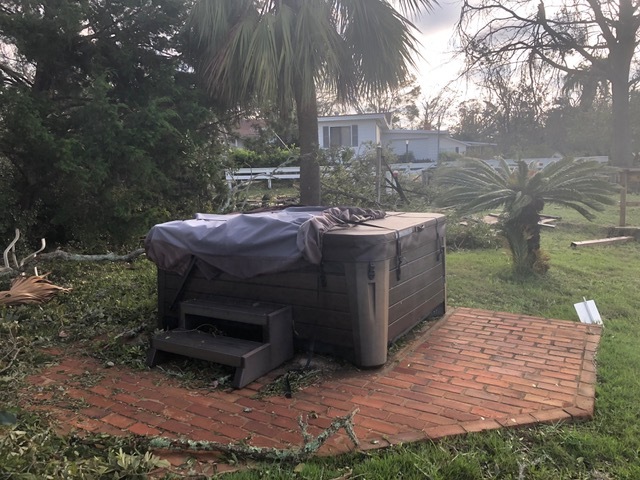 Hurricane Micheal hit the panhandle harder than most people realized….we are still in recovery and it will be a long long time before we get back to normal. I just wanted to thank you for your incredible product and show you how well they worked! The best investment I’ve made in a long time……THANK YOU SO MUCH! Note: We cannot promise that your experience will be the same as Hurricane Force winds can be unpredictable but this customer had a satisfactory experience in a really bad hurricane..